Each LEAP™5 Role needs actual tasks assigned before the Leap'ed in user can do anything. 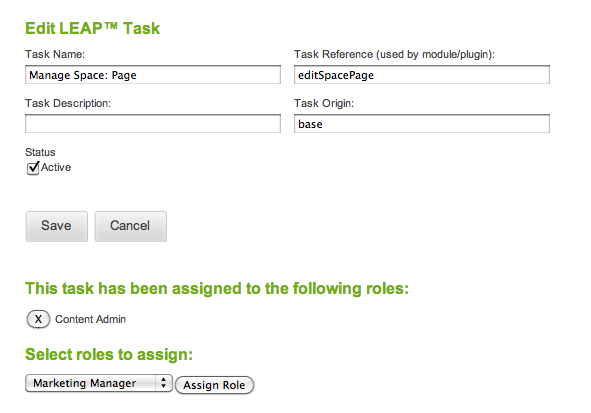 Tasks are managed in the same place as Roles, in the LEAP™ SYSTEM menu, under Security. View the List- this will come with the defaults of Page, Page Group, Site, Domain, and Zone levels. Edit a task shows the module that the task is related to. DO NOT CHANGE THE MODULES OF THE DEFAULT TASKS. If required, create an additional task and assign them to the tasks module or plugin are appropriate.